The end of #EnvelopeGate. One year after Warren Beatty and Faye Dunaway falsely announced La La Land as the best picture Oscar winner instead of Moonlight, the accounting firm responsible for the snafu, PricewaterhouseCoopers, has new regulations in place for this year’s Sunday, March 4, ceremony. 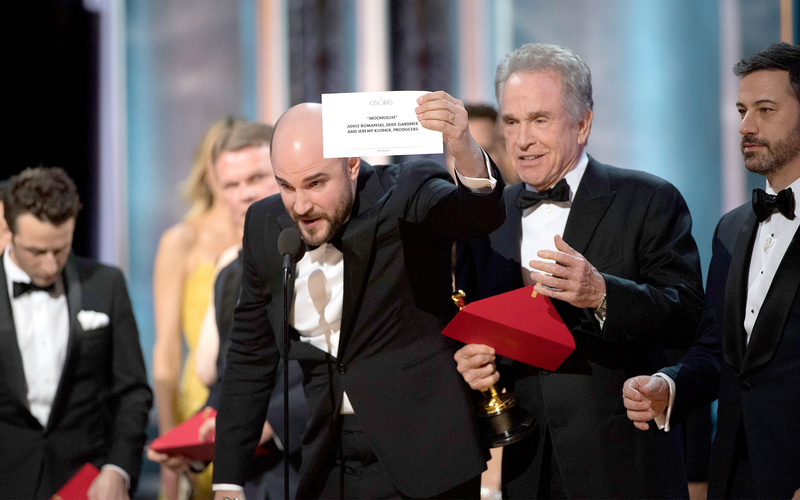 The infamous cringeworthy moment occurred after Beatty and Dunaway were handed a duplicate envelope for best actress – which Emma Stone had won previously in the night for La La Land – rather than best picture. In an interview with the Associated Press, Tim Ryan, PwC’s U.S. chairman and senior partner explained that Brian Cullinan and Martha Ruiz, the two PwC partners responsible for mishandling the envelope and failing to correct the error quickly, have not been invited back to the prestigious ceremony. Now, the firm is cracking down to ensure an error-free night in terms of handing out the statues, starting with Ryan’s personal involvement in operations this year. In order to ensure no distractions, PwC has banned the use of social media or phones backstage during the show. According to Vanity Fair, Cullinan posted a backstage photo of Stone to social media moments before he handed off the wrong envelope. A new procedure will be in place in which the celebrity presenting the category and a stage manager will confirm that they have received the right envelope in order to avoid any onstage surprises. Additionally, a third ballot partner will have a complete set of winners’ envelopes and will also have the winners’ list committed to memory. This person will be seated with the Oscar producers in the show’s control room. In an unlikely event of another mix-up, everyone will be prepared to act fast. All three balloting partners will attend show rehearsals in order to practice what to do in case of a major error. The 90th annual Academy Awards will air on ABC on Sunday, March 4.